Light up your home with this Westinghouse One-Light Exterior Flush-Mount Lantern. With a simple jelly jar shape, steel construction, antique brass finish and clear glass, this piece has a versatile aesthetic that is compatible with a variety of architectural styles. Install this lantern above an entryway to guide your way at night. You can also use it to light up your deck area, patio, or balcony. Wherever you mount it, you will enjoy the lantern's ample light and understated style. 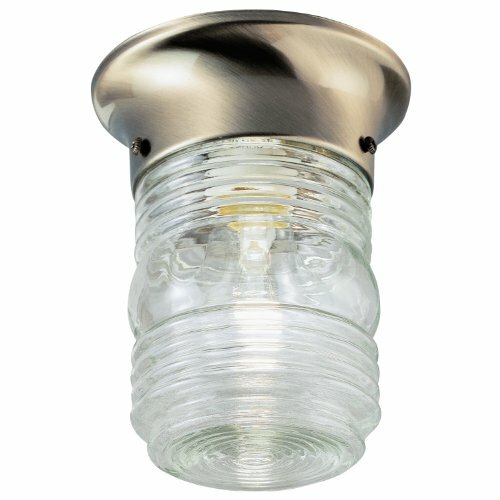 The fixture is 6 by 4-3/4 Inch (H x D). It uses one medium-base light bulb, 60-watt maximum (not included). This Westinghouse lantern is Underwriters Laboratories listed for safety. It is backed by a five-year warranty against defects in materials and workmanship.